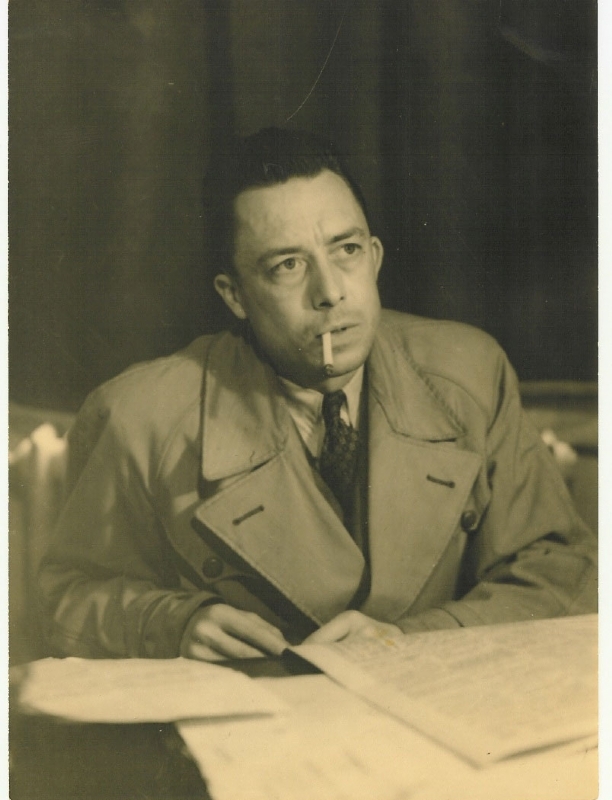 Albert Camus was a famous Philosopher from France, who lived between November 7, 1913 and January 4, 1960. He became 46 years old. Albert Camus was a French writer. He was born in Algeria and the pied-noir origins. He grew up in abject poverty, but got a place at university. Here he was attacked by tuberculosis, a disease that continued to plague him for life. In 1940 he moved to France. During the Second World War, he was in the French Resistance and became a journalist in the underground newspaper Combat. It was in the newspaper he taught Sartre to know. He is born under the zodiac scorpio, who is known for Transient, Self-Willed, Purposeful, Unyielding. Our collection contains 90 quotes who is written / told by Albert, under the main topics: Age, Art, Beauty, Experience, Finance. "Alas, after a certain age every man is responsible for his face"
"A guilty conscience needs to confess. A work of art is a confession"
"It's a kind of spiritual snobbery that makes people think they can be happy without money"
"You cannot create experience. You must undergo it"
"Without work, all life goes rotten. But when work is soulless, life stifles and dies"
"Without freedom, no art; art lives only on the restraints it imposes on itself, and dies of all others"
"Without culture, and the relative freedom it implies, society, even when perfect, is but a jungle. This is why any authentic creation is a gift to the future"
"When you have really exhausted an experience you always reverence and love it"
"What the world requires of the Christians is that they should continue to be Christians"
"What is a rebel? A man who says no"
"We used to wonder where war lived, what it was that made it so vile. And now we realize that we know where it lives... inside ourselves"
"We turn toward God only to obtain the impossible"
"To know oneself, one should assert oneself"
"To insure the adoration of a theorem for any length of time, faith is not enough, a police force is needed as well"
"To correct a natural indifference I was placed half-way between misery and the sun. Misery kept me from believing that all was well under the sun, and the sun taught me that history wasn't everything"
"To be happy we must not be too concerned with others"
"To be famous, in fact, one has only to kill one's landlady"
"To assert in any case that a man must be absolutely cut off from society because he is absolutely evil amounts to saying that society is absolutely good, and no-one in his right mind will believe this today"
"To abandon oneself to principles is really to die - and to die for an impossible love which is the contrary of love"
"Those who write clearly have readers, those who write obscurely have commentators"
"Those who weep for the happy periods which they encounter in history acknowledge what they want; not the alleviation but the silencing of misery"
"Those who lack the courage will always find a philosophy to justify it"
"The only real progress lies in learning to be wrong all alone"
"The need to be right is the sign of a vulgar mind"
"The myth of unlimited production brings war in its train as inevitably as clouds announce a storm"
"The modern mind is in complete disarray. Knowledge has stretched itself to the point where neither the world nor our intelligence can find any foot-hold. It is a fact that we are suffering from nihilism"
"The gods had condemned Sisyphus to ceaselessly rolling a rock to the top of a mountain, whence the stone would fall back of its own weight. They had thought with some reason that there is no more dreadful punishment than futile and hopeless labor"
"The evil that is in the world almost always comes of ignorance, and good intentions may do as much harm as malevolence if they lack understanding"
"The desire for possession is insatiable, to such a point that it can survive even love itself. To love, therefore, is to sterilize the person one loves"
"Stupidity has a knack of getting its way"
"Some people talk in their sleep. Lecturers talk while other people sleep"
"Men are never really willing to die except for the sake of freedom: therefore they do not believe in dying completely"
"Men are convinced of your arguments, your sincerity, and the seriousness of your efforts only by your death"
"Martyrs, my friend, have to choose between being forgotten, mocked or used. As for being understood - never"
"Man wants to live, but it is useless to hope that this desire will dictate all his actions"
"Man is the only creature that refuses to be what he is"
"Man is an idea, and a precious small idea once he turns his back on love"
"It is not your paintings I like, it is your painting"
"It is normal to give away a little of one's life in order not to lose it all"
"It is a kind of spiritual snobbery that makes people think they can be happy without money"
"For if there is a sin against life, it consists perhaps not so much in despairing of life as in hoping for another life and in eluding the implacable grandeur of this life"
"For centuries the death penalty, often accompanied by barbarous refinements, has been trying to hold crime in check; yet crime persists. Why? Because the instincts that are warring in man are not, as the law claims, constant forces in a state of equilibrium"
"Every revolutionary ends up either by becoming an oppressor or a heretic"
"Every man needs slaves like he needs clean air. To rule is to breathe, is it not? And even the most disenfranchised get to breathe. The lowest on the social scale have their spouses or their children"
"Every act of rebellion expresses a nostalgia for innocence and an appeal to the essence of being"
"Don't walk behind me; I may not lead. Don't walk in front of me; I may not follow. Just walk beside me and be my friend"
"Don't wait for the last judgment - it takes place every day"
"Don't believe your friends when they ask you to be honest with them. All they really want is to be maintained in the good opinion they have of themselves"
"Culture: the cry of men in face of their destiny"
"Charm is a way of getting the answer yes without asking a clear question"
"A free press can, of course, be good or bad, but, most certainly without freedom, the press will never be anything but bad"
"You have to be very rich or very poor to live without a trade"
"Ah, mon cher, for anyone who is alone, without God and without a master, the weight of days is dreadful"
"After all, every murderer when he kills runs the risk of the most dreadful of deaths, whereas those who kill him risk nothing except promotion"
"After all manner of professors have done their best for us, the place we are to get knowledge is in books. The true university of these days is a collection of books"
"A taste for truth at any cost is a passion which spares nothing"
"A man's work is nothing but this slow trek to rediscover, through the detours of art, those two or three great and simple images in whose presence his heart first opened"
"A man without ethics is a wild beast loosed upon this world"
"One leader, one people, signifies one master and millions of slaves"
"I would rather live my life as if there is a God and die to find out there isn't, than live my life as if there isn't and die to find out there is"
"Retaliation is related to nature and instinct, not to law. Law, by definition, cannot obey the same rules as nature"
"Nobody realizes that some people expend tremendous energy merely to be normal"
"In the depth of winter I finally learned that there was in me an invincible summer"
"We always deceive ourselves twice about the people we love - first to their advantage, then to their disadvantage"
"Nothing is more despicable than respect based on fear"
"Methods of thought which claim to give the lead to our world in the name of revolution have become, in reality, ideologies of consent and not of rebellion"
"How can sincerity be a condition of friendship? A taste for truth at any cost is a passion which spares nothing"
"Your successes and happiness are forgiven you only if you generously consent to share them"
"We are all special cases"
"The society based on production is only productive, not creative"
"In order to understand the world, one has to turn away from it on occasion"
"Real nobility is based on scorn, courage, and profound indifference"
"You will never be happy if you continue to search for what happiness consists of. You will never live if you are looking for the meaning of life"
"You know what charm is: a way of getting the answer 'yes' without having asked any clear question"
"There is but one truly serious philosophical problem and that is suicide"
"He who despairs of the human condition is a coward, but he who has hope for it is a fool"
"By definition, a government has no conscience. Sometimes it has a policy, but nothing more"
"Blessed are the hearts that can bend; they shall never be broken"
"Beauty is unbearable, drives us to despair, offering us for a minute the glimpse of an eternity that we should like to stretch out over the whole of time"
"At any street corner the feeling of absurdity can strike any man in the face"
"At 30 a man should know himself like the palm of his hand, know the exact number of his defects and qualities, know how far he can go, foretell his failures - be what he is. And, above all, accept these things"
"As a remedy to life in society I would suggest the big city. Nowadays, it is the only desert within our means"
"An intellectual is someone whose mind watches itself"
"All modern revolutions have ended in a reinforcement of the power of the State"
"All great deeds and all great thoughts have a ridiculous beginning. Great works are often born on a street corner or in a restaurant's revolving door"